RMF keeps its pole position after the first nine months of 2018, issuing $2.52 billion of HMBS securities for a 33.9% market share, a drop from its commanding 40% Q2 market share, but still well ahead of second place AAG. AAG issued $437 million of HMBS in Q3, 73% more than RMF’s $253 million, for an overall 20% market share. 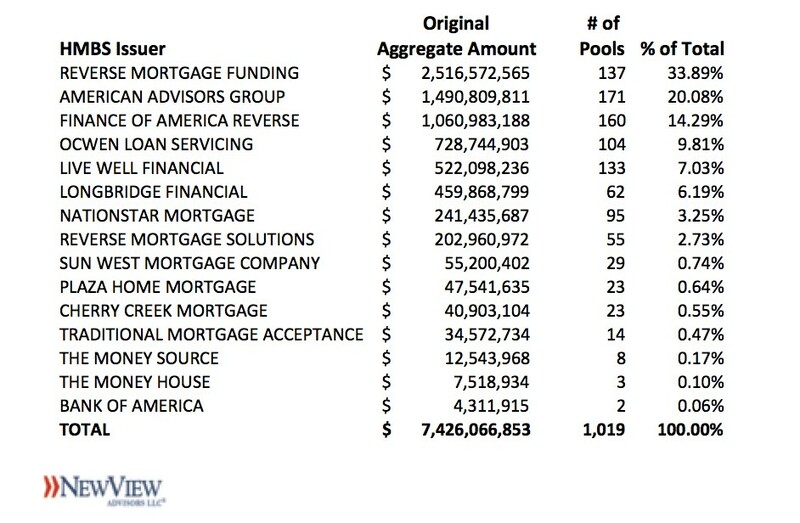 RMF issued no seasoned pools in the quarter. FAR stays in third with $1.06 billion issued and 14.3% market share. Ocwen Loan Servicing and Live Well Financial again round out the top five issuers. Ocwen issued $728.7 million for a 9.8% market share, and Live Well was fifth with $522.1 million issued for a 7% market share. The top five issuers accounted for 85% of all issuance, down 1% from last quarter. There were 14 active HMBS issuers last quarter – only Bank of America did not issue HMBS in Q3. The first nine months of 2018 saw $7.43 billion of HMBS issued, with Q3 issuance at $1.71 billion, off by more than $1 billion from either the first or second quarters. Unless highly seasoned pool issuance returns, expect lower volume for the foreseeable future. As we have noted previously, tail issuance will provide some volume (and profit) stability to HMBS issuers to offset this slowdown. HMBS issuance volume for the first nine months of 2017 totaled $7.29 billion.